Peas and carrots, peanut butter and jelly, salsa and chips, and of course pear and blue cheese round out my top pick combos. I may have forgotten a few so please add to the combo convo. 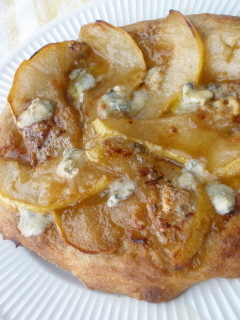 The blue cheese used here was 'Cashel Blue'. If you are a blue fan you must check this one out, it has been a favorite and summer picnics for years. 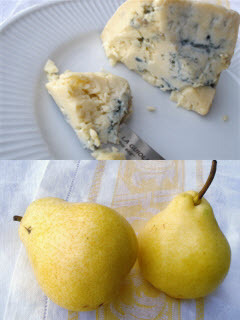 If you don't plan to use Cashel Blue, be sure to use a high quality blue cheese. Preheat oven to 500°. While the oven is heating shape your dough into 4 small rounds. Poke several small holes in the crust with a fork to prevent bubbling. Transfer pizza dough to whatever, pan, stone, etc you will be using for cooking. While the oven continues to warm up melt butter in a large sauce pan. Brush crusts with melted butter, and cook without toppings for about 5 minutes. Add brown sugar to the butter and stir until dissolved. Add the pear slices to the butter and fry about 2-3 minutes on each side. Transfer pears to dough in desired pattern. Cook for 10 or so minutes more, or until golden brown. Sprinkle with blue cheese crumbles and drizzle with left over butter.